US, 1952, 83 minutes, Colour. Errol Flynn, Maureen O' Hara, Anthony Quinn, Mildred Natwick. 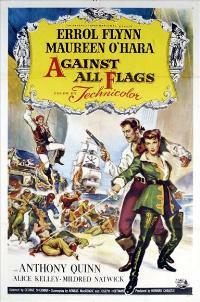 Against All Flags is enjoyable but very conventional pirate material. Made in the early '50s, it is a reminder of what Errol Flynn was like as a swashbuckling hero in the '30s and '40s e.g. Captain Blood, The Sea Hawk. Maureen O' Hara had also had her pirate days in The Spanish Main and Sinbad the Sailor. Here she is a vigorous heroine indeed. Genevieve Bujold and Robert Shaw owe a lot to this couple for their pirate antics in James Goldstone's The Scarlet Buccaneer (1976). Anthony Quinn appears as the villain and was to emerge during the '50s as a very popular star. The remake by Universal of this film was The King's Pirate, with Doug Mc Clure and Jill St. John in the central roles. Neither had the personality or status of the original stars and so the second film, while conventionally enjoyable, does not have such impact. 1. The appeal of pirate adventure films? Why? 2. Comment on the style of pirate films like this one: use of colour, locations, ships, battles etc.? 3. The appeal and interest of the plot: spies, suspense, romance, action? How well were these ingredients portrayed? Examples? 4. The hero of this kind of film? Errol Flynn and his type? The nature of heroism, shrewdness, loyalty. patriotism, capacity for love, ability for fighting, wisdom in outwitting enemies., saving everyone? How convincing was Errol Flynn in this role? 5. The portrayal of the villainous pirate? Anthony Quinn's style? The type, his background, reasons for piracy, skill, ruthlessness, fascination for the Spitfire, trusting Flynn, the final fight? 6. The significance of the robust Spitfire as the heroine? The vigour of Maureen O'Hara, the background of his father and his fortifications, her business on the island, as a captain of the seas, her capacity for fighting and sword fighting, the romantic aspects? Her disillusionment with the hero, the final happy ending? 7. The portrayal of the pirates, the soldiers? How conventional, how interesting? 8. The complication of the Indian princess and her attendants? Her Scottish tutor and the vigour of this lady? 9. The emphasis on the fights, deceptions, the pirates' final bluff in getting their ship out of the harbour, battles? 10. Reliance on audience presuppositions about adventure, heroes, right and wrong, justice and patriotism?